Whether you love spiders or hate them (the Curiosity offices are divided on that point), you've got to admit that they're pretty impressive. With the webs, the eyes, the sticky (and fuzzy) feet, and the venom, you've got yourself a recipe for a top-tier predator. But here are two words that aren't often associated with spiders: "adorable jumping." And here are six more: "helps scientists build a better robot." If you're a gardener, chances are that at some point you've spotted a tiny, eight-legged figure hurling itself through the air. These are jumping spiders and they've made their home pretty much everywhere, including Mt. Everest. 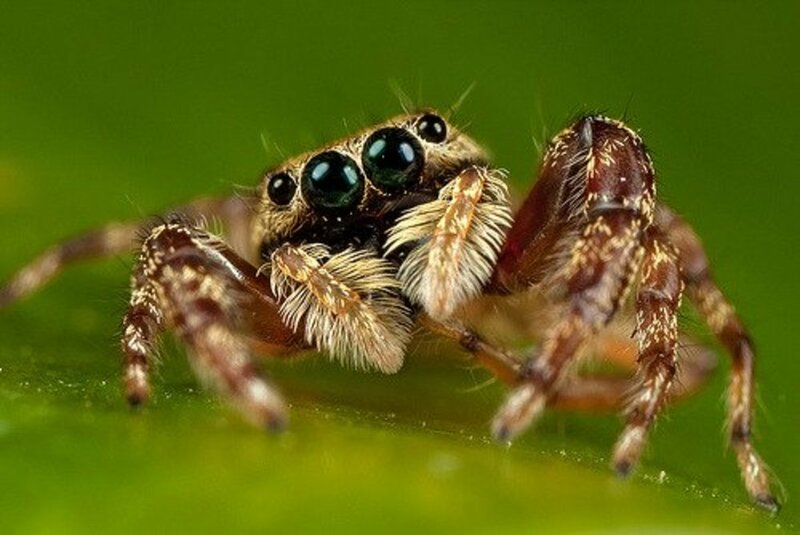 They're not like other spiders, and not just because of how cute they are (how could you say no to those eyes?). Although the females build nests, jumping spiders don't really do the web-weaving thing. Instead, they mainly use their silk as a safety line, hooking it to a surface before they leap at an unsuspecting snack. They're generally between half an inch and an inch long (13 and 25 millimeters), and the largest ones have been spotted jumping up to eight times their body length. That's akin to a human making a standing leap as long as a school bus. We could go on — we haven't even touched on the fact that they do adorable little dances to attract a mate or how they communicate with each other through the silks they leave behind, but that would be a digression. After all, we're not talking about how awesome all jumping spiders are. We're talking about how awesome one particular jumping spider is. Meet Kim. Kim the regal jumping spider (Phidippus regius) is the first and only graduate of lead researcher Mostafa Nabawy's jumping academy. The little critters love jumping, obviously, but it's hard to train them to do it on command since they only need to eat once per week. To get around that, the researchers tried another learning method that wasn't based on food motivation. They would manually move their spiders from one platform to another, hoping that eventually, they'd begin to make the leap themselves by force of habit. But spiders are an obstinate bunch, and out of the four spiders they tried to train, only one learned to do what they wanted. Nice job, Kim. Researchers were soon able to hold the platforms far enough apart that they could test the limits of Kim's leaps, and watch exactly how she made them via high-speed cameras and CT scans. And what they learned could make futuristic robots much more mobile. It's hard to teach a robot how to move through space, even if you aren't trying to get it to literally hurl itself through the air at a target. Bug-based jumping mechanics for robots aren't unheard of but up until this point, they've mainly focused on fast, long-distance leapers like grasshoppers. But from Kim, the researchers could not only learn how to jump a long distance but also learn to calculate a landing strategy for controlled, precise jumps. One of the first lessons they learned from Kim was that she wasn't jumping nearly as far as she was capable of. Her maximum distance tapped out around five times her body length, but she would overshoot the longest jumps often enough that researchers came to the conclusion that it was her eyesight that was limiting her, not her jumping ability. They also found she applied different strategies to different jumps. For short distances, she didn't concern herself with saving energy, and instead made fast, low-angle leaps. But for distances on the long end of the spectrum, she aimed high instead, and jumped more slowly and cautiously. They also had the chance to test a longstanding belief about jumping spiders — the spiders' leg muscles aren't particularly strong, so many scientists hypothesized that their jumps were being augmented by hydraulics. (Yes, all spiders have hydraulic systems in their legs like they're teeny-tiny Transformers. Deal with it.) But to the researchers' surprise, all of Kim's jumps were within the range that could be accomplished by muscles alone. Thanks to the CT scan, they were also able to watch how the geometries of her body worked to produce that kind of sudden, rapid energy. While actually building a robot based on Kim's unique abilities may be a few years off, she's already kick-started a whole new way to think about robot mobility. There are a lot more itsy bitsy creatures to be found in the world besides these eight-legged long-jump all-stars. Pick up the National Wildlife Federation's "Field Guide to Insects and Spiders of North America" and don't forget it on your next hike. We handpick reading recommendations we think you may like. If you choose to make a purchase through that link, Curiosity will get a share of the sale.